Oh, how we will miss you, Georgetown Circulator. First, a moment of silence for the end of the DC Circulator's service through upper Georgetown. Taking the regular Metro bus instead just won't be the same. Sure, you actually have two more weeks until the end of days for Circulator service on Wisconsin Ave., NW, from M Street, NW to Whitehaven St., but some of us need to start mourning now. We actually wrote to the Mayor. Thanks, Georgetown Metropolitan and WeLoveDC. 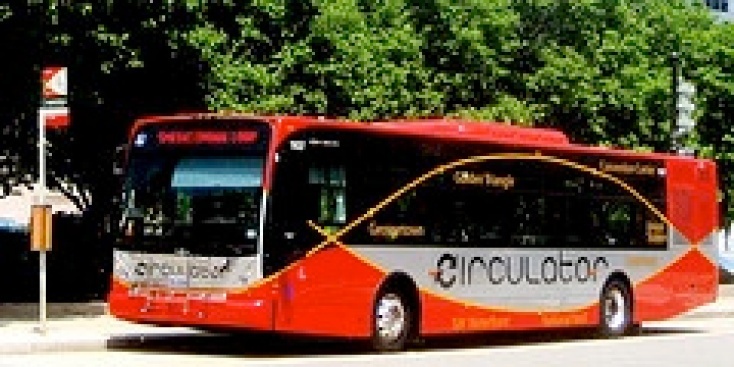 In addition, the Circulator will no longer serve any stops on the north side of M Street, NW, because it will only operate eastbound on M Street. The stop at Wisconsin Ave. & M Street (in front of the now-closed Nathan's Restaurant) will also move onto Wisconsin Ave. instead of M Street. And if you were counting on the Smithsonian-National Mall loop, which ran on weekends only, to take visiting relatives around the Mall, etc., that's gone too -- albeit temporarily. As of Oct. 4, the Smithsonian-National Mall loop will be discontinued through the fall and winter months. Weekend service will resume on April 3, 2010.